December's Visiting Teaching gifts are here! 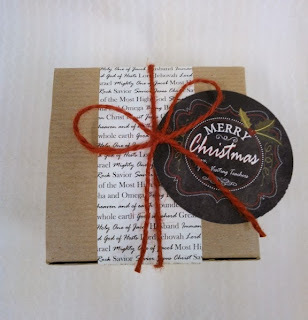 It is always fun to create gifts around the holiday themes, especially this season. The title of the message from the Ensign is "The Divine Mission of Jesus Christ: The Only Begotten Son." We've used a kraft box (2"x2"4"), filled it with the message (printed on a cream paper), 2 Pioneer Valley buttercream caramels, and a special magnet of Christ. We received special permission from artist Del Parson (of Utah) to use one of his pictures of Christ, entitled "Jesus of Nazereth." We added words at the bottom of the magnet "I believe that thou art the Christ, the Son of God," which is a quote from the message. We hope that sisters nationwide will be able to view this magnet all year long and have it inspire them daily.